During my first time living in Germany, we lived in the town of Celle, in a British Forces quarter area. (Also called ‘patches’). The importance of these quarter areas in fostering an Army community and a separation from the native Germans was significant as the families inside supported each other. While we were there the wives created very close ties as their husbands were away in Bosnia for 6 months. Also my father commanded 160 men so my mother had a sort of unwritten responsibility to visit the wives and she was the link sometimes through my father to other women’s husbands (a role in a time before mobiles and internet were widely used). He would call my mother if they were to be away for a long time and I would go and speak to all the wives and let them know they might not hear from their men for a few days and not to worry. The only form of communication with their husbands was ‘blueys’ (A distinct blue coloured paper airmail letter which took about a week to get out there). The soldiers were allowed a once a week phone calls if at they were at their base, but if not could have several weeks sometimes without speaking to their wives; This was an important point making the wives network are something that spouses, living outside of the UK, relied upon. A ‘families team’ called The Rear Party, had a welfare package of money to lay on children’s parties and outings was also an important support institution. We often went on excursions to a local German attraction; the Serengeti Zoo Park. The Families officer also sorted out welfare problems as well; this all meant we were very much enclosed and ‘removed’ from the German community during these times. We sort of closed ourselves in. These photos showed Army children including myself all playing together and interacting within the Army community. 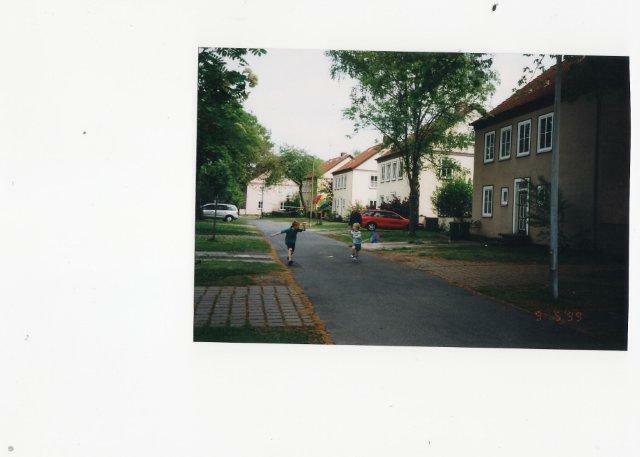 Although the 12 houses on this street were within a German housing estate you did not mix with German children at all. We even had German neighbours right next door. 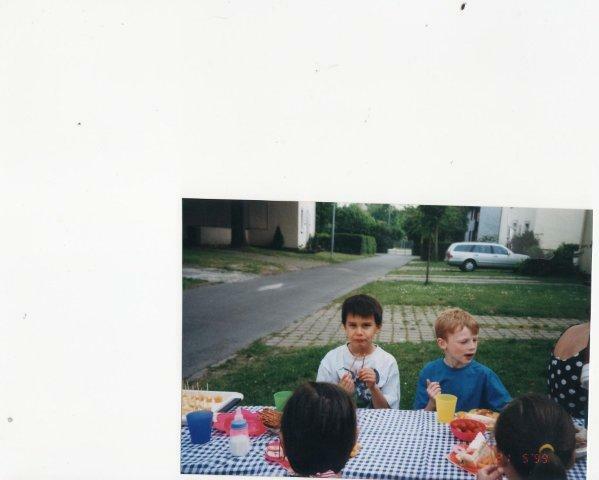 They spoke no English and at that time my mother spoke no German. So for 3 years the conversations were limited to a few words on the weather and “hello, good day” etc. although they were very friendly and often the Grandma of the neighbours used to bring us round apple cake. 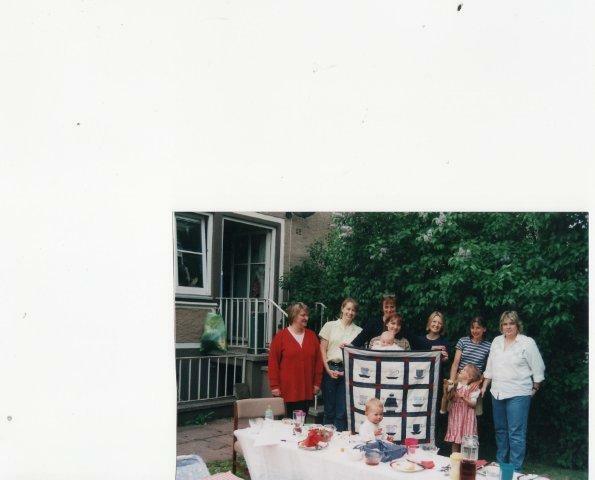 This showed a group of Army wives including my mother in a social group quilting. 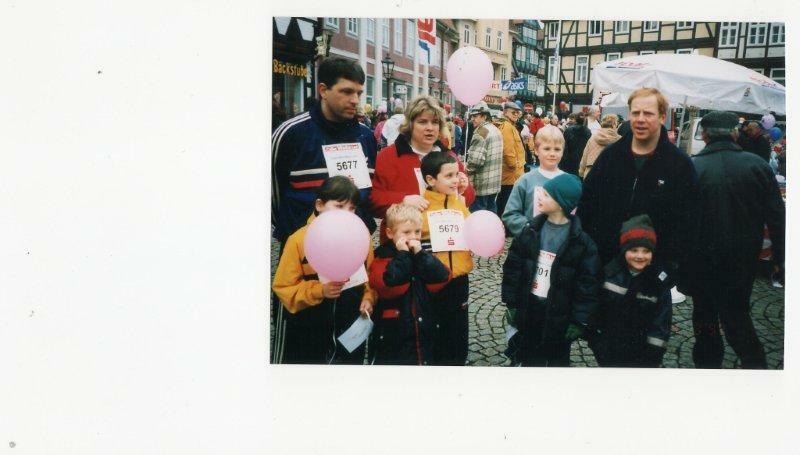 However the Army community did extend itself into the local community on occassion; one being the Celle Wasa-lauf (a sponsored run)( http://www.celler-wasa-lauf.de/.) which was participated in annually by British people there. 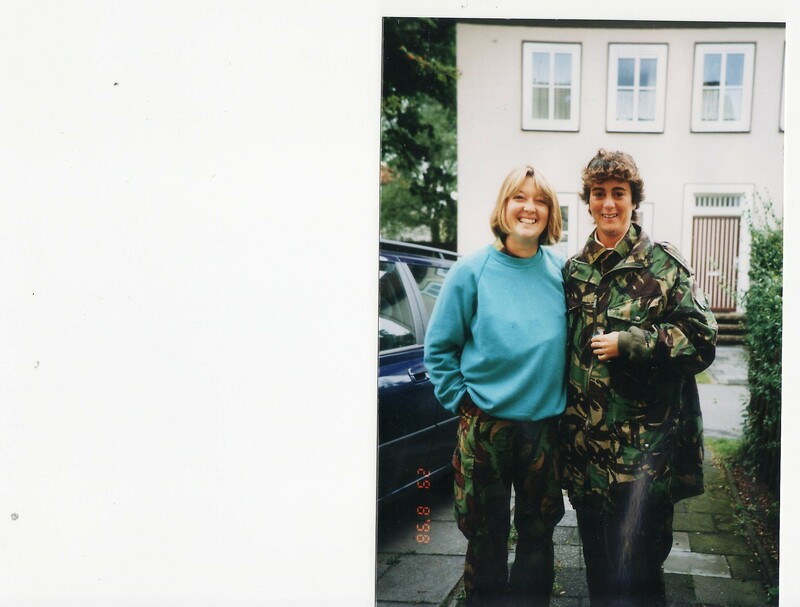 The above picture shows my mother with another soldier’s wife before participating in the unusual activity of the ‘Wives’ exercise’ which involved undertaking a day and a night of a military style mission to mark the return of the Battalion of soldiers from Bosnia. Even my brother and I participated in summer camps of a very military-esque style (run by the ex-Army personnel unsurprisingly). 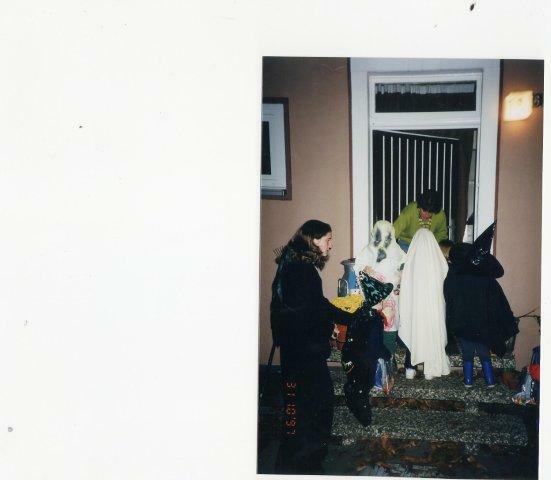 In my first time in Germany we lived in an enclosed community, in a town, Celle, which was not a particularly welcoming town to the military and that can make a difference as to how enclosed we were. 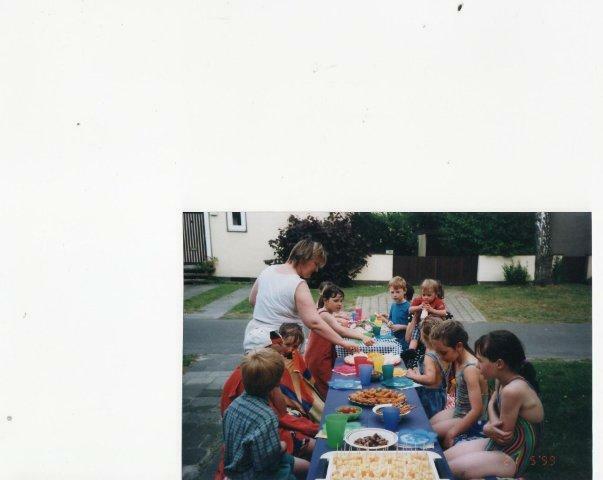 We lived out in the German community in Bad Lippspringe, near Paderborn. Some families had to live in German hirings or rented houses including ourselves. Therefore there was a greater need to be more integrated. We had German neighbours, and it was our second tour of Germany so my mother’s German had improved and she could talk to neighbours more freely. 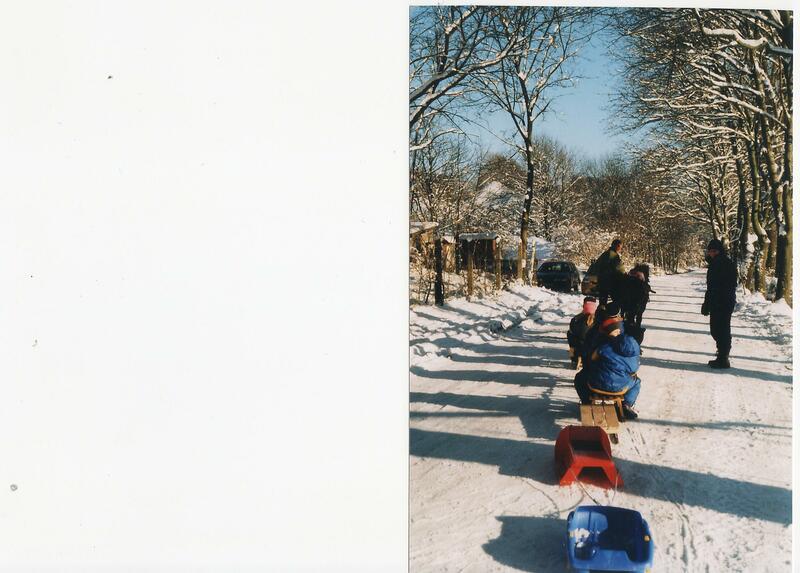 The image above shows us going out sledging still with British neighbours, but we shared the slopes with Germans from the village. On New Years Eve we invited our German neighbours into our party which showed a much more sociable atmosphere to that in Celle.